How can something like coffee, that’s so wonderful, so natural, so singularly important to so many people, ruin your day? It just doesn’t seem fair. Think back. You spend a large chunk of your daily budget on a triple venti soy no foam latte or a grande cold brew and your day seems to be off to a great start. Short line at the local coffee shop. Check. Caffeine fix. Check. Into the office early. Check. All seems right with the world, but then mid-morning rolls around and things begin to change. First, it’s the slightly alarmed look you get from the IT guy as you stop him in the hall and try to explain your computer issue. Surely adding a printer isn’t that big of a deal? Next, it’s a small slight from your cubicle neighbor as you gossip over the top of your cube. Either she’s heard this gossip before, or she’s just not a morning person. Regardless, she’s moved out of earshot and has quickly returned to her work. But then things seem to turn around. The team assembled for your 11 a.m. meeting all seem eager to get out of the conference room and start working on the project at hand! Odd, but ultimately a good sign, right? And that’s when you notice; Bob has coffee breath. Panic flashes through your mind. The concerned looks. The leaning away. The quick escape from the conference room. All caused by bad coffee breath. Your coffee breath. Well, yours and Bob’s. Many things we eat and drink can linger throughout the day and cause bad breath. However, coffee is a prime offender for a few reasons. The caffeine in coffee causes xerostomia, or dry mouth. Most people drink coffee after they’ve brushed their teeth. Add-ins like milk and sugar can trigger a bonanza of bacteria in the mouth. Coffee itself is highly acidic and sulfurous. And we all know that sulfur never smells good. From a scientific perspective, caffeine will dry out your mouth and reduce saliva production. Germs and bacteria are naturally found in the mouth, but when saliva isn’t there to do its job of washing it away, it will grow unchecked and feed on the food particles that also become stuck. When naturally occurring bacteria in the mouth consume protein particles they release waste in the form of volatile sulfur compounds (VSC). VSCs are simply another name for sulfur gas, and they are what we perceive as bad breath or halitosis. So, when you have bad breath, it’s just your mouth spewing sulfur gas into the air to bother those around you. Since most people brush their teeth at best twice a day, it’s usually first thing in the morning and the last thing at night. That means most of what you eat and drink during the day can stay on your teeth and gums. Yuck! Espresso is particularly vicious and intense, so it can linger for a long time. But, don’t think you’re safe with a run-of-the-mill dark roast. It, too, can stick around. And with it, coffee breath. If you’re not a coffee purist, chances are you add some milk, cream or sugar to your coffee. Unfortunately, the sugars in milk and sweeteners can cause an overgrowth of bacteria in the mouth, which will result in bad breath. Not only that, but the high acidity of coffee lowers the pH level in your mouth and encourages even more bacteria to grow! And then there’s the sulfur. What do you think of when you hear the word sulfur? Rotten eggs? Sewer gas? Nothing pleasant, right? In short, things that smell rotten. The bad news is coffee can be very sulfurous, and therefore very stinky. The longer it stays on your teeth and gums the more sulfur that is produced as the germs and bacteria go to town doing what they do, which is consuming protein, releasing more sulfur gas, and causing bad breath. Are you panicked yet? Are you worried about having constant coffee breath and contemplating giving up coffee forever? Don’t worry. You don’t have to forego coffee to get rid of coffee breath. You just have to get rid of sulfur gas. Fortunately, there are a couple of things you can do to temporarily get rid of coffee breath. Brush your teeth more frequently, preferably after consuming coffee or food. Yes, this means bringing a toothbrush and toothpaste to work and brushing in the office bathroom. Whatever it takes to keep dreaded coffee breath at bay, right? You can also drink more water. This has the benefit of washing the coffee (and anything else) off your teeth, tongue and gums while also keeping you hydrated so the saliva keeps flowing. Eat a snack like an apple to remove lingering coffee residue from your mouth. You can even try gum or mints but be careful that they are not just covering your bad breath with a minty flavor and smell. Good health and oral hygiene practices like drinking more water, eating well and brushing your teeth go a long way toward minimizing coffee bad breath. However, you’re just putting a band-aid on the problem. You could spend day and night using these practices to fight bad breath. Or, you can finally get rid of coffee breath forever by using SmartMouth – a great coffee breath mouthwash! How can SmartMouth eliminate bad breath? Regular zinc has been touted for many benefits. You may have heard it can stop a cold, in fact, it’s the main ingredient in many cold-relief products. Zinc is great, but zinc ions are amazing in combating halitosis, otherwise known as bad breath. Zinc ions not only have the power to get rid of sulfur gas but they also block bacteria from producing more sulfur gas. The bacteria continue to do their thing, but without the unpleasant smell. While you can find regular zinc in a few products, only SmartMouth Activated Oral Rinse has clinically proven zinc ion technology that eliminates and prevents sulfur gas for 12 hours per rinse. 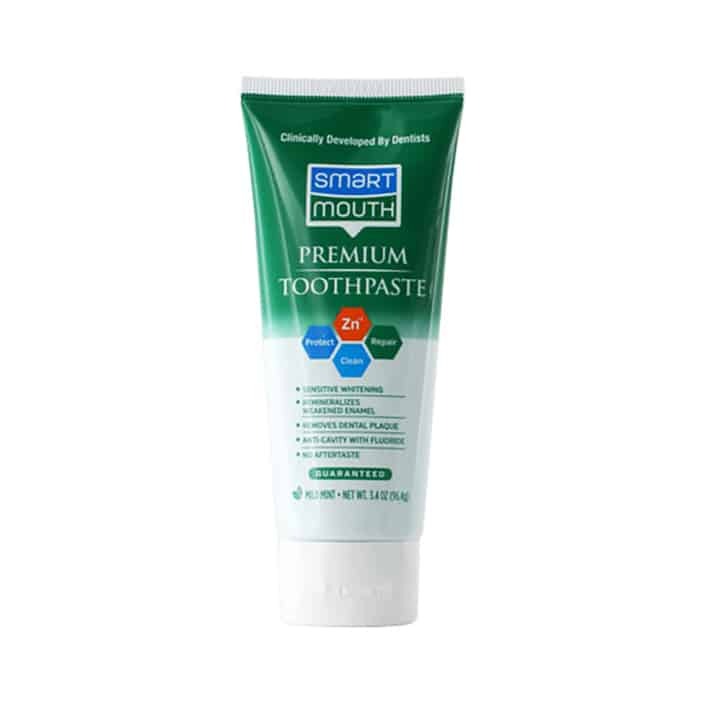 Used once in the morning and again before bed, SmartMouth can stop bad breath for a full 24 hours. That’s right. You can get rid of bad breath, even coffee breath, forever. 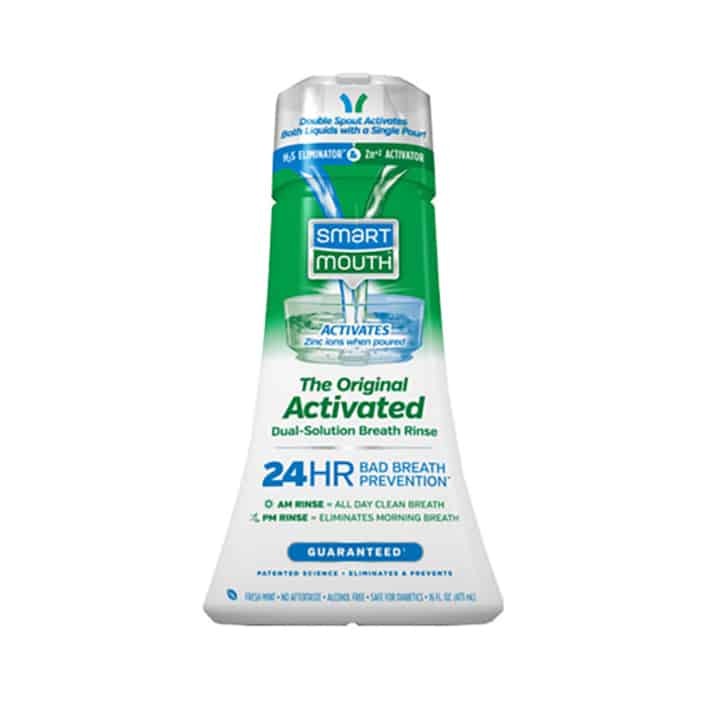 SmartMouth Activated Oral Rinse has a unique two-liquid formula: The Sulfur Eliminating* Solution, which destroys sulfur gases, and the zinc-rich Activating Solution. When combined, they activate to release millions of zinc ions that block the bacteria’s ability to ingest protein particles and ultimately stops sulfur gas production and the resulting bad breath. Don’t give up coffee, try SmartMouth instead, the perfect coffee breath mouthwash. You can find it at in the oral care aisle of most pharmacies and supercenters and online at Amazon. It comes in three formulas for all your oral health needs. Original Activated, Clinical DDS, and Dry Mouth Relief all feature SmartMouth’s patented zinc ion technology so they all can help you be confident that you have fresh, clean breath all day long. And if you’re looking to eliminate coffee breath when you’re on-the-go or traveling, try SmartMouth’s Travel Packs and Dry Mouth Relief Mints. The convenient travel packs are TSA-approved and work just like the dual-pour bottle to provide the right mix of liquids in one single use pack. Best of all, they easily fit in your purse, suitcase, pocket or glove box, so you’ll never have bad breath, no matter where you go. SmartMouth Dry Mouth Mints eliminate* dry mouth, protect your breath, and provide a soothing, moisturizing sensation any time of day. They provide an invigorating burst of flavor while refreshing your breath with zinc ion technology. To learn more like us on Facebook and follow us on Twitter. *Results may vary. 24-hour bad breath protection results associated with twice daily use. SmartMouth products are not intended to diagnose, treat, cure, or prevent any disease. All SmartMouth products come with our guarantee that SmartMouth works exactly as described or your money back. Always consult your oral healthcare professional.